by Harvey W. Yurow Ph.D.
One of the last relatively unexplored areas in analog photography is permanganate bleach re-reversal (PBR), which can result in striking, surrealistic photographic diapositives, having both negative and positive portions on a single frame. These can consist of low density shadow areas of a grainy appearance, contrasting with relatively high density middle-tones and clear highlights. In addition, very thin, dark contour lines occur at the borders between shadows and middle-tones, and shadows and highlights. It is hoped that a reading of this paper will help to transform PBR from “at best a diabolically uncertain process”, as was used by an early worker to describe preparation of thiourea blue lantern slides (Benfield), to one more easily managed. The recent replacement of dichromate by permanganate bleach in such contemporary commercial black-and-white reversal processes as Fomapan R100 and Kodak T-Max 100 (Kodak 1999), because of environmental concerns, has brought back the phenomenon of PBR, which has been reported on the Internet (Russell) Consequently, it is well worth studying, especially with the ultimate object of introducing a degree of reproducibility into the technique. In addition, if analog photography is to survive in this digital age, it must emphasize its “cooler” side (McLuhan), which can involve the unexpected., which PBR exhibits in abundance. The PBR story resembles a detective novel, in which clues are provided at various intervals in the tale. The use of permanganate bleach was first reported by Namias in 1900, in conjunction with an oxalic acid clearing bath, in the first practical process for reversal of a negative photographic image to a positive one. 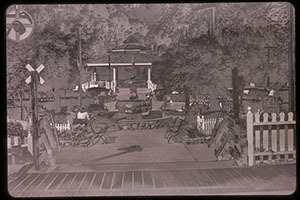 In essence, the film was first developed to a silver negative image, the silver removed by bleaching, excess permanganate and manganese dioxide removed with an oxalic acid clearing bath, followed by a second exposure to light, and second development of the remaining silver halide to a positive image. It became the basis for the Lumiere Autochrome technique, the first practical color diapositive process, and its Dufaycolor successor. John G. Capstaff of Kodak, in US Patent 1,460,703, was apparently the first to report PBR in connection with the original technique for processing amateur black-and-white motion picture prints by reversal. Following permanganate bleaching of the exposed and developed negative, and clearing with sodium bisulfite, the film was submitted to a controlled diffused light second exposure to correct for errors in the first exposure, given second development, and fixed in hypo, resulting in a positive suitable for projection. Capstaff reported that if the film was initially underexposed, and given a limited second exposure, re-reversal often occurred, leading to low, rather than expected high density shadows. However, when a small amount of silver nitrate was added to the bleach, or a light fogged leader strip of film initially bleached, or if the film was initially bathed in dilute sodium hydroxide, re-reversal was prevented (Capstaff 1926, Kodak 1926). It was speculated that added silver ion precipitated traces of chloride ion present in tap water used to prepare bleach solution, and that chloride ion was somehow the culprit. In this regard, Glafkides indicated that tap water for photographic solutions often contains 10-50 mg/l of chloride ion. Similarly, bromide content for a variety of US water facilities averages around 50 mg/l (Amy). In 1931 Rahts appears to be the first to have published D log E curves showing the PBR effect, for Agfa Reversal Motion Picture Film, with sodium sulfite instead of sodium bisulfite clearing bath. He noted that the former gave a “hill-shaped”curve showing a unique abnormality in the shadow region (decreased density), especially with diffused light second underexposure (ca ¼ that required for completion), resulting in re-reversal, or inversion of values. Rahts further noted that the effect was eliminated when silver salts were added to the bleach. Smethurst in 1936 reported that for certain negative emulsions, insufficient clearing, as well as incomplete second exposure, resulted in re-reversal. 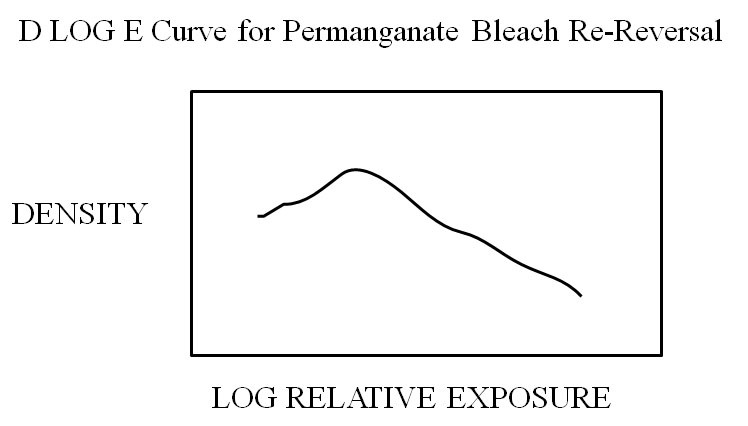 A second example of “hill-shaped” D log E curves was indicated in 1948 by Verkinderen, working with Gevaert Panchro Reversal Motion Picture Film, when insufficient second exposures followed permanganate bleach and sodium bisulfite clearing bath. He called the result “double reversal phenomenon”. It should be pointed out that three other photographic techniques that give negative and positive image portions, (Sabatier Effect, Agfacontour Film, Waterhouse Effect) are characterized by “trough-shaped” (in cross section) D log E curves. In the early 1930's, acid-dichromate largely replaced acid-permanganate baths among photographic companies and amateurs because of greater stability, (one exception being Ilford) and because the latter “exert a complex influence on the re-exposure sensitivity which may effect tone reproduction” (Ives). In this connection, Miller indicated that “permanganate bleaching promotes a graded sensitivity of the residual silver halide. Then, by varying the second exposure conditions, the residual halide can be made developable to any desired degree over a considerable range of average density and highlight speed.” This preference held true until the 1990's, when less ecologically damaging permanganate was brought back by Kodak for their black-and-white reversal slide kits. With regard to clearing following the bleaching step, Kodak motion picture film required a 21% sodium sulfite clearing bath after bleaching (Kodak 2005), while for Kodak T-MAX 100 roll film, 1.5% sodium bisulfite was employed (Kodak 2003) In this connection, re-reversal was reported, e.g., on photo.net, where one writer (Russell) indicated that with Ilford Pan F and Kodak's reversal kit, “some of the pictures are positive, some negative, some both!” It is therefore of interest to explore permanganate bleach re-reversal, in order to ascertain the actual mechanism, and to see whether it can be made reproducible and put to good use. The author must first insert the caveat that baring rigorous experimental studies, the following is a reasonable explanation, but has not been definitely established. For permanganate bleach re-reversal, a good starting point is the Gurney- Mott theory of the photographic process (James 1977), with modification by Malinowski. Silver bromide grains in a photographic emulsion contain both surface and internal sensitivity specks of silver or silver sulfide, which can act as electron traps for photoelectrons resulting from light exposure, and subsequently serve as catalysts for the development step. Malinowski added to Gurney-Mott by considering photoholes, which can oxidize silver sensitivity specks to silver bromide. Thus, photo electrons and photoholes can work in opposition. With permanganate bleach, dense parts of the negative silver image bleach more rapidly than do lighter areas. In addition, the reaction rate is higher deeper within the emulsion layer, rather than at the surface (Haist). Silver ion formed during bleaching can diffuse directly into the interior of undeveloped silver bromide grains to fill any interstitial silver ion vacancies (Agv+) present. This ionic silver can minimize internal attack on silver sensitivity specks in silver halide grains by photoholes (Step 3) that are a prelude to re-reversal. Consideration of the negative image vis-a-vis bleaching indicates what is essentially the primary reason for the difficulty in reproducibility of PBR. Highlight areas are essentially free of undeveloped silver bromide grains, and appear as relatively clear areas in the final product. Middle-tones contain varying amounts of residual silver bromide, so that the appreciable amount of resulting silver ion is apparently sufficient to give the expected densities in the resulting diapositives. It is in the deep shadow regions of the negative image where two possibilities exist – either the amount of silver ion produced will be sufficient to block photohole attack and prevent PBR, or it will be insufficient to do so. As a generalization,the first instance occurs with high key subjects and normal exposures, while the latter is favored with low key subjects and underexposures. Because it is the reflectivity of the actual images photographed which determine which pathway is followed, it is easy to see the problem with obtaining reproducibility. Step 2: Oxidation of bromide ion on silver bromide grain surface. Step 3: Attack on internal silver sensitivity specks by positive hole (defect electron) insertion. A surface bromine atom is able to insert itself into the interior of a silver bromide grain via positive hole insertion. Because of the overlap of the electronic orbitals of neighboring bromide ions, such a bromine atom cannot remain localized; an electron from a neighboring bromide ion very rapidly jumps into the atom, and in this way by purely electronic motion, and without any motion of a bromine nucleus, the bromine atom travels rapidly through the grain, carrying with it an elementary positive charge (Falla, James 1966, 1977, West) and can oxidize internal sensitivity specks composed of small clusters of silver atoms. However, as mentioned in Step 1, silver ion formed during bleaching, from silver image areas for highlights and mid-tones, and concentrated in the bleach solution, can diffuse into the interior of remaining silver bromide grains to fill any silver ion vacancies (Agv+) present, and thus inhibit attack on silver sensitivity specks via the Law of Mass Action, i.e., Ag+ + e- = Ag. In this connection, James (1977) indicated that various desensitizations were favored by lower silver ion concentrations. A similar mechanism is also involved in thin (0.02mm) contour line formation at boundaries between shadow and middle-tone or shadow and highlight areas. Thus, silver ion can diffuse laterally in the emulsion layer a short distance into a neighboring area of lesser silver density, because of concentration effects, prevent internal image desensitization, and result in dark contour line formation. Step 4: Growth of internal silver sensitivity specks. At some time during bleaching, the attacked silver sensitivity specks become too small to be stable, i.e., one or two atoms. If disintegration of the silver atom into a silver ion and electron gives more rapid kinetics than oxidation of the atom by bleach, mobile electrons are released into the conduction band and can enlarge sensitivity specks in the grain interior. (Jaenicke, James 1977) In addition, larger sensitivity specks are more resistant to positive hole attack. The process somewhat resembles recrystallization of a solid, whereby large crystals grow at the expense of smaller ones. Step 5: Internal image desensitization. After bleaching, the film is subjected to treatment with aqueous sodium bisulfite, which removes precipitated manganese dioxide, and dissolves a thin surface layer of the silver bromide grains, exposing underlying sensitivity specks, and partially restoring surface sensitivity to light exposure (Kowaliski). As mentioned previously, Smethurst indicated that insufficient clearing, i.e., a shortened time, and/or lower bisulfite concentration can give results similar to those for insufficient second exposure. In those image areas where enlarged internal sensitivity specks are preferentially formed (shadows), the net result is that a graded sensitivity to re-exposure of residual silver halide results. This gradation can be preserved (re-reversal) either by insufficient clearing or by incomplete second exposure followed by development (see below). For the latter, photoelectrons formed on the surface by the second exposure are preferentially trapped in the grain interior to form a latent image not readily reached during second development. Thus, shadow areas develop to a lesser extent, and as a result, are of relatively low density. To complicate the picture, photographic emulsions can contain varying ratios of internal/surface sensitivity specks. Consequently, Jolly first postulated that for a strong Sabatier Effect, which also involves internal image desensitization, the emulsion should have mostly interior sensitivity specks, then in a later publication switched to surface sensitivity specks, while, in contrast, Jian-Bin proposed that the surface and internal sensitivity centers should be well matched. The latter appears to be based upon more rigorous experimental evidence. A similar situation may obtain with PBR. In addition, as indicated by Malinowski, photo-excited positive holes, and presumably those formed via oxidation of bromide ion by permanganate, can be neutralized in silver halide crystals, either by forming a complex with silver ion vacancies, which are an intrinsic component of the crystal lattice, or with copper or iron impurities in the crystal. Because these characteristics can vary with emulsions, differences in PBR from brand to brand of film may be expected. Nevertheless, because higher contrast emulsions give more pronounced Sabatier and equidensity effects (Jolly, Lau and Krug), these emulsions should be more promising as starting materials. In their paper on photographic reversal effects, Yule and Maurer mention the phenomenon of “regenerated halide desensitization” (RHD). Although no references are given, or have been found by the author, it is suspected that permanganate bleach re-reversal may come under this heading. The above mechanisms nicely explain the observations of Capstaff that motion picture negatives that are underexposed and subjected to an insufficient second exposure, often undergo re-reversal, and that addition of a small amount of silver nitrate to the bleach tends to prevent it. On the other hand, the presence of small amounts of chloride or bromide ion in the bleach solution enhance positive hole insertion and consequent re-reversal of shadow areas. However, it may be that the presence of excess amounts of bromide or chloride impurities can result in complete removal of internal sensitivity specks, and elimination of internal image desensitization. Thus, apparently, optimum re-reversal occurs within a limited ratio range of Ag+ / Br- concentration in the bleach bath. Consequently, reproducibility of permanganate bleach re-reversal can be problematic, and somewhat of a “hit or miss proposition”. Summing up the above theoretical discussion, there are a number of parameters that enhance re-reversal, as indicated in the following Table. Certain of these parameters are more easily under the control of the experimenter. As indicated above, with regard to film emulsion, it appears that relatively high contrast emulsions would be of more promise. Scenes with significant shadow areas and small but prominent highlight areas, e.g., white picket fences, building columns, human figures, etc, and producing relatively low overall negative density, as well as underexposure, are most likely to give favorable results. Conversely, predominant highlight areas add to the amount of silver ion in the bleach bath, which could hinder re-reversal. In this connection, Jones and Condit measured subject brightness values for a large number of outdoor scenes. Thus, for nearby scenes, both unshaded and lightly shaded, average minimal values (presumably shadows) were found to be 12.5 and 4.6 ft. Lamberts, respectively. Dunn and Wakefield noted that because of atmospheric haze and greater merging of the lower half -tones, shadows become less deep as distance from the camera increased. Underexposure and/or red filters, the latter of which cut-off sky illumination, can push shadows into Zone 0 (film base plus fog), or Zone I (density 0.1) (Adams), with minimum silver consequently present in undeveloped silver bromide, and enhanced probability of re-reversal. As regards the halogen impurities in bleach, for bromide and chloride ions, these appear to be optimum at around 50mg/liter, so that these concentrations can be added to the distilled water used to prepare bleach. It is with the clearing bath and the second exposure that considerable variations may be attempted to obtain optimum results. While halogen ion present in bleach mainly decreases sensitivity of resulting shadow area silver halide remaining, clearing bath and second exposure, if carried to completion, can exert a counteracting “leveling” effect. In this connection, Kowaliski indicated that, “the permanganate or bichromate ion also eliminates the sensitivity specks at the surface of the still unexposed silver halide crystals and thus makes them almost insensitive to light. This re-sensitization is obtained from the clearing bath by a not very well defined mechanism: the bisulfite ion seems to contribute not only to a sulfur deposit sufficient to again form nuclei of external sensitivity, but also the dissolution of a very shallow surface layer of the crystals, and the resulting uncovering of pre-existing internal nuclei at low depth”. Additionally, Smethurst wrote, “Clearing must essentially be complete, since the negative materials used are not intended for the reversal process, and there is a distinct danger of a partial positive appearing instead of a duplicate negative if the operation is not thoroughly carried through. The second exposure given must be adequate, or the same trouble may result”. Subject Matter – As with the Sabatier Effect, the most suitable outdoor subjects are usually those containing geometric shapes such as buildings, bridges, monuments, boats, etc, with complex surfaces containing both sunlit and shadow areas. Figures in the landscape add to the surrealistic effect, by often showing a person either entering or emerging from a “fog”background. Preferably, medium-range scenes with prominent dark (shadow) areas (Dunn and Wakefield) should be considered in order to lower the total amount of negative silver present after first development. As a rule of thumb, high reflectivity object surfaces, which “make the scene”, by giving prominent black contour lines, should only occupy about one tenth of the total view – greater amounts tending to inhibit PBR. In this connection, a useful measurement of reflectivity is the “blondel”, e.g, a white surface reflecting 90% of the incident sunlight in June (80,000 lux), reflects 72,000 blondels (Encyclopedia of Colour Photography). Visualization - Because a sunlit sky full of clouds lightens shadows appreciably, a clear sky with consequently deeper shadows, is more suitable. At this point Adams' technique of “visualization” becomes useful, i.e. projecting the final photographic image in the mind before actually photographing it. With PBR, this visualization technique will initially require considerable effort, so as to lower the percentage of highlights or sky area in the frame. As a guide, one may use Milner's definition of overall slide transmission, brilliant 20%, average 10%, dark 5-7%, with the last named often giving the best results. Initial Exposure – Figures are for outdoor sunlight, with a Wratten #25 red filter (filter factor 3.0 with Tech Pan). Underexposure (as compared to that for normal reversal), favors re-reversal, following Capstaff's observation. A normal reversal exposure is 1/125 sec. at f11. Different degrees of underexposure will give different ratios of positive to negative in the resulting image, because of the hill-shaped D log E curve, each image with its own appeal - bracketing being preferred, e.g. 1 stop under (1/250 sec. f11), 1.5 stops under (1/500 sec. f9.5) and 2 stops under (1/250 sec. f16). With a Wratten #29 deep red filter, (filter factor 6.0), recommended exposures at 1/500 sec. are f6.3, 8, 9.5, and 11, overall results changing noticeably as underexposure is varied. While the dictum is to “expose negatives for the shadows and diapositives for the highlights”, re-reversal slides are preferentially exposed so as to give minimum negative shadow density, while preserving sufficient negative middle-tone and highlight density to produce the characteristic dark contour lines. First Development - Kodak DK-50 for 12 minutes at 20 C with 4.0g/l of potassium thiocyanate to give clear highlights, followed by stop bath and wash. Prior to development, the light fogged section of the 35mm film roll (approximately 17cm) is cut off and discarded, so as to lower the total amount of negative silver available for entering the bleaching bath and hindering re-reversal (calculation given below). Bleach Bath - Potassium permanganate 2.0g/l and either sodium bisulfate 25g/l, or concentrated sulfuric acid 10cc/l as substitute. To this single use bath, prepared with distilled water, is added 0.08g/l of potassium bromide to enhance re- reversal via positive hole insertion. The bleach is used at around 10 minutes after bromide has been added (odor of bromine). Bleaching is for 5 minutes at 20 C with vigorous agitation (5/30). The author has used a single reel Nikor stainless steel 35mm developing tank. Remember, that in the bleaching step two opposing forces are at play. Silver ion formed from the negative image is entering silver bromide grains to form interstitial silver and inhibit PBR, while photoholes (Br0) produced by oxidation of bromide ions by permanganate are leading to internal image desensitization, and encouraging PBR. Clearing Bath - 0.5% sodium bisulfite, freshly prepared, for 1 minute with rigorous and constant agitation at 20 C , to give incomplete clearing and enhanced re-reversal, based upon results reported by Smethurst,, who employed 1% sodium bisulfite for 5 minutes, followed by rinse. For complete clearing, the average literature value reported for the product of bisulfite % concentration x time in minutes = 5. The clearing bath step appears to be critical in the results obtained. Removal of manganese dioxide byproduct is very rapid and occurs within one minute. Subsequent treatment restores sensitivity of the residual silver bromide to light exposure, and as indicated above, appears to exert a leveling effect on differential sensitivity, so as to discourage re-reversal. Second Exposure – Because sensitivity to light increases quickly with time of standing subsequent to clearing, second exposure should occur within about 5 minutes after the end of the clearing step. Because the permanganate bath has destroyed the original dye sensitizers, the film can be handled safely in red light (Clerc). As with the clearing step, longer exposure favors a leveling effect, and elimination of PBR. Kodak (1999) indicates that for motion picture film reversal, 8600 lux-seconds (800 footcandle-seconds) are required for complete second exposure. This is approximately equivalent to a 10 second exposure to a 60 watt tungsten bulb at 12-18 inches. Underexposure to produce re-reversal will be some fraction of this value. For Rahts the values reported were ¼-1/8 that of complete exposure. Illumination was provided with a frosted tungsten bulb, 15 watts at 0.5 or 1 meter, with short strips of 35mm film, weighted by coins at both ends, and exposed under water in an 16x20 black tray. As a starting point, optimum exposure with a 15w bulb at 0.5 meters was found to be around ninety seconds. This relatively long exposure time is as a consequence of incomplete clearing and re-sensitization. Second Development - 5 minutes in Kodak D-52, D-72, D-97, or comparable developers, followed by stop bath, fixer and wash.
Renditions – In general, the results with PBR are as indicated in the following table. Because of the importance of shadow rendition in PBR, the following Table regarding reflectivity of various types of landscape shadows is relevant (Turner). Because of the strong retarding effect of silver ion on re-reversal, which is produced by bleaching of the negative image and consequent filling in of interstitial silver ion vacancies in silver bromide grains, it is informative to estimate the amount of silver contained in the negative images of a 20 exposure roll of 35mm film with that amount present from the light fogged leading edge of the roll formed when the film is inserted into a camera. Using the photometric constant P , where P is defined as the grams of silver /100cm2 of film (Mees), and has a value of 0.01g for density of 1.0, 0.02 for D= 2.0 and 0.03 for D=3.0, one can calculate silver content as a function of film density. Milner indicates that an average B&W slide has a transmission of 10%, corresponding to a density of 1.0. Thus, for a 20 exposure roll of 35mm film (250cm2), this density corresponds to 25mg of silver. For the 17cm light fogged strip, with a density of approximately 3.0 for Technical Pan, and containing about 50cm2 of film, the amount of silver is approximately 15mg, an amount comparable to the aforementioned. With processing of half rolls of this film (10-12 exposure), silver from the fogged end surpasses the total for the negatives. Referring back to Capstaff, fogged film was used to condition fresh permanganate bleach prior to use, in order to avoid re-reversal. Therefore, the light fogged film end should routinely be cut off and discarded before first development to increase the likelihood of re- reversal. While the above experimental results are an interesting start to understanding a complex photographic process, much more remains to be uncovered. The following variations of the above experimental technique are worth investigating by the photographic experimenter. It bears repeating that in re-reversal two competing processes are operative, bromine atom (positive hole) insertion into the silver bromide grains and silver ion insertion into silver ion vacancies in the same grains, which makes for some complicated, but very interesting chemistry! While the former process can be fairly easily controlled by adding a known amount of potassium bromide to the bleach, the latter will depend upon the amount of negative silver initially present as a source of silver ions. As stated above, any film that gives successful reversal may be tried. These films are usually characterized by gamma values considerably greater than one, and by relatively high Dmax, and include a number of cinematographic intermediate and print films (Kodak 2013), and fine grain, slow speed roll films (Ilford Pan F). A list of films potentially amenable to re-reversal is given by the Dr5 website. Substitution of sodium sulfite for sodium bisulfite in the clearing bath may enhance re-reversal (Rahts). Other possible clearing agent to try are oxalic acid or ascorbic acid, to perhaps decrease the leveling effect. Following the comment by Jolly that powerful M-Q developers can partially overcome internal image desensitization, a less powerful (lower pH) second developer, such as DK-50, may be preferable. Another possible area of investigation involves the trivalent manganese ion, which is an intermediate in the bleaching process (Hickman), is a powerful one electron oxidizing agent, and a powerful gelatin hardening agent, and is commercially available. The Sabatier Effect and Permanganate Bleach Re-Reversal give essentially similar results. However, a major difference is that contour lines for the former are thicker, and result from varying reflections from curved surfaces – the cosine effect, while for the latter, they are thinner, and the result of silver ion lateral diffusion into shadow areas. Finally, the Author is of the opinion that controlling permanganate bleach re-reversal makes the Sabatier Effect seem like child's play. While still experimenting with this phenomenon, he has occasionally observed images with white contour lines, which could be the subject of a future paper. Therefore, he would be interested in hearing from anyone having experience with the PBR effect, and can be reached at hmyurow@outlook.com. Click to enlarge and follow arrows to see all slides. These include a series of four exposures taken of the fountain and gazebo at Old Poway Park, Poway CA., with successively increasing underexposures at 1/500 sec. at f6.3, 8, 9.5, and 11, with a Wratten #29 filter The scene is essentially made up of moderate reflectivity portions, with significant high key objects. Other illustrative slides were taken in San Diego at Balboa Park and at the Zoo. Adams, A. The Negative, pp 1, 60, 106-110, Little, Brown, Boston 1981. Benfield, A.G., “Royal Photography Society Minutes”, British Journal of Photography, 73, 78 (1926). Berg, W., “Techniques of Investigating the Latent Image in Silver Halide Emulsions”, Photographic Science Symposium – Paris, J. Pouradier Editor, p 161, Focal, London 1967. Bowler, S.W., “Miniature Transparencies by Reversal Process”, British Journal Photographic Almanac, p 136-146 (1950). Bowler, S.W., “Simplified Reversal”, British Journal Photographic Almanac, pp 149-155 (1956). Capstaff, J.G., Controlled Reversal of 16mm Motion Picture Film, US Patent 1,460,703, 3 July 1923. Capstaff, J.G., Reversal Process, US Patent 1,600,797, 21 September 1926. Clerc, L.P., Photography: Theory and Practice, Volume 4: Monochrome Processing, D.A. Spencer Editor, p 576, Amphoto, New York 1971. The Dufaycolor Manual, 2nd Edition, Dufaycolor Company, New York 1939. Dunn, J.F. And Wakefield, G.L., Exposure 3rd Edition, p 109, Fountain, Hanfordshire, England 1974. Encyclopedia of Colour Photography, Deribere, M. and Cailland, L, Editors, p 88, Fountain, London 1962. Falla, A., “The Action of Bromine and Chromic Acid on the Sensitivity Centers and the Latent Image of Silver Bromide Emulsions”, Science and Applications of Photography, R. S. Schultze Editor, pp 150-154, Royal Photographic Society, London 1955. Glafkides, P., Photographic Chemistry, pp 61, 173, Fountain, London 1958. Haist, G., Modern Photographic Processing, pp 307, 326-327, 356-363, McGraw Hill, New York 1975. Hickman, K.C.D., Photographic Reversal Process and Bleach Bath for Use Therein, US Patent 1,984,133, 11 December 1934. Ilford, Application Sheet. Reversal Processing Using Ilford Black & White Films to Make Monochrome Transparencies, September 2003. Ives, C.E., el al, “Processing Methods for Use with Two New Black-and White Reversal Films”, Journal of the Society of Motion Picture and Television Engineers, 66, 1-11 (1957). James, T.H., Editor, The Photographic Process, 3rd Edition, pp 124, 258, Chapter 8, MacMillan, New York 1967. James, T.H., Editor, The Photographic Process, 4th Edition, pp 174-175, 190, 449-450, MacMillan, New York 1977. Jaenicke, W., “The Mechanism of Photographic Development”, Photographic Science and Engineering, 6, 185-196 (1962). Jian-Bin, H. et al, “Sabattier Effect in Internally Sensitive Emulsions, Journal of Imaging Science and Technology, 40, 229-232 (1996). John, D.H.O. And Field, G.T.J., A Textbook of Photographic Chemistry, pp 30-31, Chapman and Hall, London 1963. Jolly, W.L., “An Explanation of the Sabatier Effect”, Photographic Science and Engineering, 29, 138-143 (1985). Jolly, W.L., “Solarization Demystified”, http://www.cchem.berkeley.edu/~w/eme/SOUTLINE/html 1994. Jones, L.A. and Condit, H.R., “The Brightness Scale of Exterior Scenes and the Computation of Correct Photographic Exposure”, Journal of the Optical Society of America, 31, 651-678 (1941). Kodak, British Patent 258,814, May 11,1926. Kodak, Deutsche Republic Patent 444,349, 21 May 1926. (abstract in J.M. Eder, Jahrbuch fur Photographie, Kinematography, und Reproductionsverfahren, 1928-1929, 31, (Tiel II) p 420, Wilhelm Knapp, Halle 1933. Kodak, J-6, Kodak Direct Positive Panchromatic Film, 35mm, Rochester, New York 2-65. Kodak, Publication J-87, Kodak Professional T-Max 100 Direct Positive Film Developing Outfit, Rochester, New York November 2003. Kodak, H-1-7278, Eastman Tri-X Reversal Film, February 1999. Kodak, Processing Kodak Motion Picture Films: Module 15. Processing Black-and-White Films, Rochester, New York April 2005. Kodak, Kodak Motion Picture Products Price Catalog, Rochester, New York January 25, 2013. Kowaliski, P., Applied Photographic Theory, pp 474-476, Wiley, London 1972. Lau, E. and Krug, W., Equidensitometry, Focal, London 1968. Lumiere, A. and L., and Seyewetz, A., “Catalysis of Peroxide and Permanganate Bleaches”, Photographic Journal, 44, 177 (1901). Malinowski, J., “The Role of Holes in the Photographic Process”, The Journal of Photographic Science, 16, 57-62 (1968). Mees, C.E.K., The Theory of the Photographic Process, 2nd Edition, p 810, McMillan, New York 1954. Miller, H.A. Russell, H.D. and Crabtree, J.I., “Direct Positive Processing of the New Kodak Blue Base Reversal Films”, PSA Journal, 15, 382-389 (1949). Milner, C.D., Making Lantern Slides and Filmstrips, 3rd edition,pp 22-24, Focal, London 1957. Namias, R., “Reversed Negatives”, British Journal of Photography, 47, 679 (1900). Photo.net, “Positives and Negatives on Same Roll?” March 05, 2004. Rahts, W., “Das Umkehrverfahren”, Die Kinotechnik, 13: 207-212 (1931). Tomamichel, F., “Appearance of Reversal Effect On Silver Halide Emulsions', Reprographie I. Internationaler Kongress Koln, 1963. pp 96-102, Verlag Dr. Othmar Helwich, Darmstadt. Turner, P.K., Photographic Exposure, pp 71-77, Pitman, New York, 1940. West, B., “Silver Halide Grain and Formation of Developable Image”, Neblette's Handbook of Photography and Reprography,7th Edition, J.M. Sturge Editor, p 66, Van Nostrand Reinhold, New York 1977. Yule, J.A.C. And Maurer, R.E., “The Nomenclature of Photographic Reversal Effects”, Photographic Science and Engineering, 8, 289-292 (1964). Yurow, H.W., Photographic Developer for the Direct Production of Equidensity Images on a High Contrast Film, US Patent 6,083,671, 4 July 2000. Yurow, H.W., Whither Analog Photography? A MacLuhanesque Approach. Unblinking Eye 2012. Parks are generally the most favorable settings, because of the landscape artifact foregrounds and the tree backgrounds. Plant nurseries and wineries are also productive. Marine scenes usually have unsuitable shadow backgrounds. Backgrounds – Middle distance trees will give smoky gray shadows (negative image) and medium density middle tones (leaves in sunlight). Avoid appreciable sky areas in the view – higher silver ion content in bleach inhibits re-reversal, and irregularities in processing show up more strongly. Frontal sunlight appears best to give good contrast between shadows, middle tones and highlights. Foreground – Landscape artifacts include: statues, monuments, fountains, gazebos, picket fences, columns, signs, lampposts, benches, black ironwork, tables, umbrellas, etc. These should be a combination of high, medium and low reflectivity surfaces to give pictorial dark contour lines between shadows and middle tones or highlights (positive image). Too large a highlight area ,e.g., flat side of building, should be avoided. The gestalt of a highlight with dark contour lines emerging from a formless gray shadow area is a dramatic one, reminiscent of the “Amazon Series” of Raul Ubac. Exposure – With Tech Pan film and a Wratten #25 filter, most effective is a 1.5 stop underexposure, i.e., 1/500 sec. at f9.5.